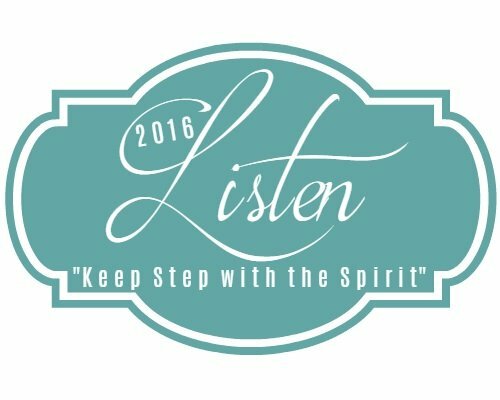 Welcome to this installment of the Listen Close, Listen Well Series. It is an honor to introduce you to Judy Dunagan. I met Judy a few years ago at Carol Kent’s Speak Up Conference. Judy is also an acquisitions editor for Moody Publishing. Judy has a heart to encourage women. Being around her is always a gift as she uplifts others and lovingly points them to Christ. But God had different plans that weekend. While dwelling in the songs of lament that David wrote, I noticed that he often turned to praise, even in the midst of his anguish and suffering. I remember first being taken aback, almost incredulous that He would ask such a thing while I was suffering. But I sensed that I needed to be obedient and follow His leading. My weeping and wrestling prayers turned to a sacrifice of praise in my journal that weekend. As I wrote a list of praise and thanksgiving to God, I found that my tears shifted from sorrow to adoration of Him. I was overwhelmed by His mercy and goodness like never before. I didn’t get answers to my questions that weekend, or even comfort that the trials would soon be over. But I came away with a deep understanding of the power of praise in the midst of suffering. I’m not sure my prayer life has ever been the same. Oh, I still pour out my heart to Him with laments and requests, like we’re encouraged to do in Psalm 62:8. But most of the pages in my prayer journals now begin with the words “A Sacrifice of Praise” written at the top. It’s how I turn my heart and mind toward Him and enter into His presence with praise. 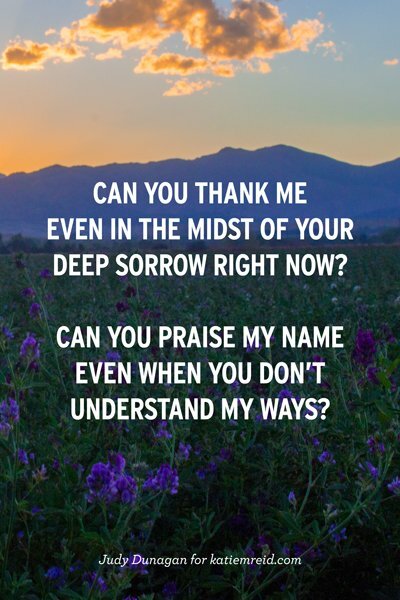 What is your favorite way to offer praise and thanksgiving to Him even in the midst of the storms of this life? 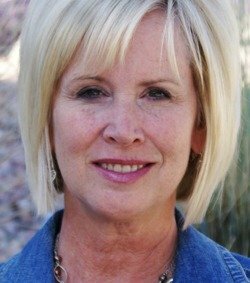 Judy Dunagan served as a women’s ministry leader for twenty years before joining Moody Publishers as an acquisitions editor, overseeing the women’s line of books and discipleship resources. A wonder seeker who chases knowledge of God and His Word, Judy is passionate about discipling women and making God’s Word come alive in everyday life. Visit her blog at judydunagan.com. And check out Moody Publishers’ new line of women’s Bible studies at moodypublisherswomen.com. I enjoyed reading this. Thank you for prompting my heart to praise and rejoice with Him – even when… What a blessing. So glad you were blessed, Kelly! What a beautiful story of how to praise God in the storms of life! Thank you for writing this post, Judy. I can’t tell you how much it spoke to my heart. I am so thankful for the Psalms, and also for your friendship. Blessings to you! Thank you so much Lauren. Love your heart for Him and His Word! Beautifully written! I have a feeling I’ll be coming back to this post over and over again throughout life, in all of its highs and lows. Thank you for the beautiful reminder! Oh, to look back and see how God was there when I wondered if he even cared. That encourages me every day as I look back. So true! Your life has reflected these truths in beautiful ways! Your words are so beautiful, Kelly. Judy, this was so timely for me! Thank you for being transparent and sharing your heart with us. It points me to Him. Thank you! So grateful you were blessed by this, Crickett! I must admit that it’s difficult to give praise and thanks when I’m suffering. But the Bible says so and there’s something about gratitude and worship. It brings us from a place of sorrow to a place of comfort. Thank you for your wise insight, Lux!